WHY Did The City of Sunnyvale REQUIRE PAMF to Prepare an EIR? A Public Agency, or Lead Agency, determines whether a “project,” such as The Sunnyvale Palo Alto Medical Foundation (PAMF), under The California Environmental Quality Act (CEQA), has potential for a direct physical change or a reasonably foreseeable indirect physical change in the environment. CEQA is a statute that requires state and local agencies to identify the significant environmental impacts of their actions and to avoid or mitigate those impacts, if feasible. The lead agency determines if an Environmental Impact Report (EIR) will be required. The Lead Agency for the PAMF Project, coincidently, was the City of Sunnyvale Planning Staff: Principal Planner Gerri Caruso and Planning Officer Trudi Ryan. The Environmental Consultants and Planners were David J. Powers & Associates. The PAMF Project was approved during the June 8, 2009 City of Sunnyvale Commission Hearing. The PAMF Project and EIR was approved and certified during the June 23,2009 Sunnyvale Council Hearing. Copies of the PAMF DEIR/FEIR are available at the City of Sunnyvale Library and Planning Dept for review. Will the PAMF Vents Exhaust Cross Property Lines? Sunnyvale is a windy city. The wind does not always blow south. In fact, the wind blows from the southeast to the north 25% of the time! 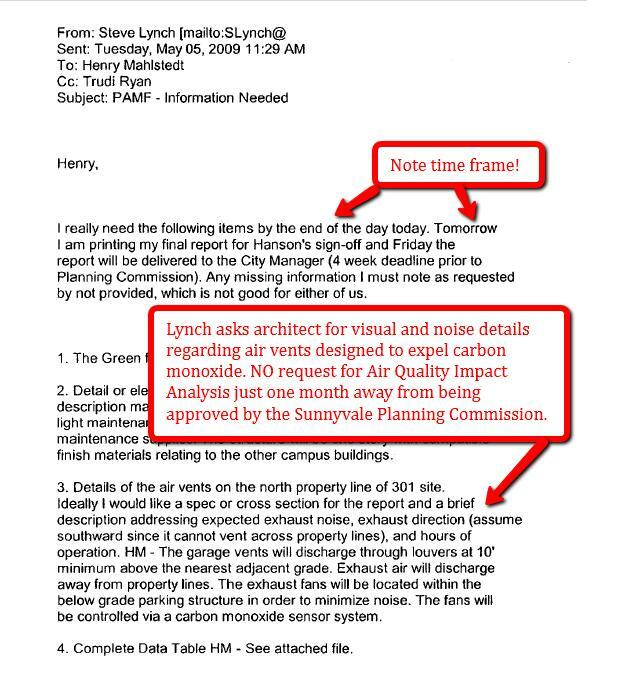 Information needed within hours, Caruso’s replacement Planner, Steve Lynch requests details regarding the Palo Alto Medical Foundation PAMF Parking Garage Exhaust Vents. Why did Lynch advise the architect to “assume south” when the wind blows toward the north as well? And why was an Air Quality Impact Analysis omitted from request? Is the air healthy? It appears that careful, strategic seating arrangement is about as important and skillful as choosing the right jurors to win a trial. Sunnyvale Planner Trudi Ryan writes to the Director of Community Development, Hanson Hom, discussing various center bull pen seating arrangement options for staff during both the Palo Alto Medical Foundation PAMF EIR, a subsidiary of Sutter Health, Project Commission and Council Hearings. 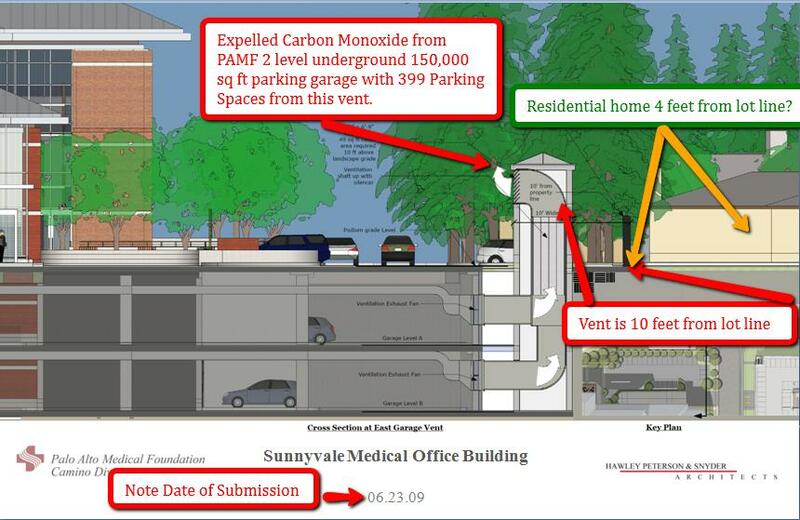 How did the objectionable, massive, 94dBA Parking Garage Exhaust Vents for the Sunnyvale Palo Alto Medical Foundation (PAMF), fly under the radar without full public disclosure or analysis? Architects Hawley Peterson Synder state the purpose of the imposing PAMF Garage Exhaust Vents, is to ventilate the carbon monoxide/air toxins/exhaust accumulating from vehicles circulating, parking and exiting PAMF’s two-level, 150,000 s.f. underground garage to total the capacity of 399 parking spaces. Notably non-existent and missing from the PAMF Draft Environmental Impact Report (DEIR) and the Final Environmental Impact Report(FEIR) were any identifiable Architectural Illustrations, discussions or analysis of the loud, powerful vent structures designed to be placed just a few feet away from residential homes. Thus began a frustrating, perilous quest to find out what the function of the vents were for, what would be the intensity of the noise measured by dBA, what amount and how dangerous would the toxic emissions be (still not adequately answered), Air Quality impacts, the distance from each property lines, etc, only to be subject to vague and non-responsive answers from the Sunnyvale Planning Staff. Our questions were of little concern to the Sunnyvale Planning Staff and never fully answered. This illustration of the vents, from Hawley Peterson Synder Architects, was presented and viewed for the first time on June 23, 2009 during the Council Hearing. Both Sunnyvale Council Members John Howe and Melinda Hamilton remarked about the vents during the hearing, “I wouldn’t want to live near those . . .” yet approved and voted “yes” anyway. Solely identified by decibel levels of the PAMF parking lot vents for each (east and west unit): FEIR Appendix J, pg 13 states 94 dBA at 5 feet. Both vents are 40-horsepower garage exhaust fans and very close to residential homes. According to Table 2, 94 dBA falls within the range of Night Club with live music. Sunnyvale Requires Palo Alto Medical Foundation ART BUDGET to be $19 MILLION! Planner Trudi Ryan informed Palo Alto Medical Foundation, a subsidiary of Sutter Health, PAMF Project Leader David Jury and Architect Henry Mahlstedt, that the City of Sunnyvale required Artwork preliminary estimate is $19M, subject to review (PAMF004905). Wow, was that $19 Million????? The news is somewhat staggering! To compare and contrast, the Sunnyvale Planning Dept conditioned PAMF to contribute just a paltry $50,000 to traffic calming devices (to slow speeding traffic) in the Heritage District Neighborhood closest to the rebuild. Wowowowow! PAMF was a high bidder for 448 Kenny Court! Palo Alto Medical Foundation, a subsidiary of Sutter Health, generously purchased this modest residential property for $1,250,000.00 on 11/13/2008 to be developed into a 3,250 s.f. Storage and Waste Management Area for PAMF in Sunnyvale! To compare apples with apples, a similar home in the neighborhood~ 389 S Pastoria Ave, SOLD for $621,000 just one month prior! Now, that’s STEEP APPRECIATION ! PAMF pays $1.25M for 448 Kenny Court!